The curse is real! 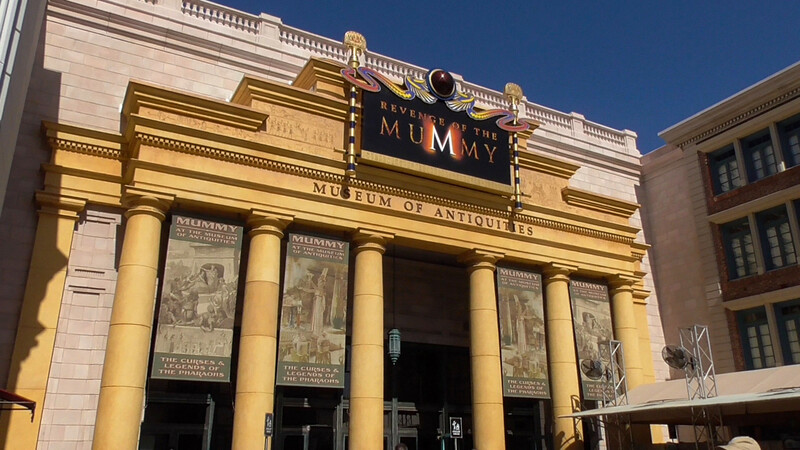 The Mummy has arisen and is after your soul in this terrifying, multi-sensory, indoor roller coaster adventure. 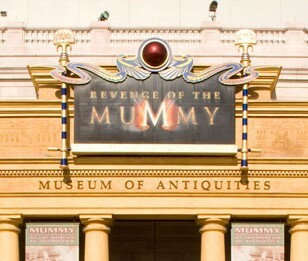 Your only hope is to escape the Revenge of the Mummy, a roller coaster unlike anything that's come before it. You'll plunge in total darkness, plagued on all sides by huge fireballs, swarms of scarab beetles and an army of warrior mummies. 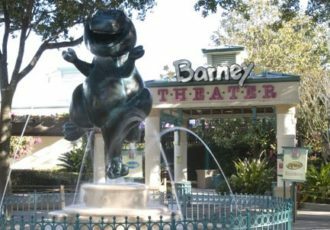 Universal Studios has taken all the terrifying thrills and spine-tingling excitement of The Mummy motion pictures and placed you right in the middle of the action. Come face to face with the Mummy as he attempts to capture your soul for all eternity. Can you survive the awesome power of Imhotep's curse… or will you be entombed inside forever? Ride during the first hour of the day for shortest line. If the line is long you can use the single rider line, which can even be quicker than the Express line. The ride launches guests at speeds up to 45 mph in virtual darkness. Does not go upside down and the drops are small though. Does include a (brief) backwards section. Fire effects may be frightening for some children as well. Many of the Egyptian hieroglyphics on the walls spell out real words and ancient warnings. This attraction replaced Kongfrontation, an opening day ride starring King Kong. A golden ape statue can be seen in the treasure room on the ride as a tribute, on the left side near front of the room up high on a shelf.